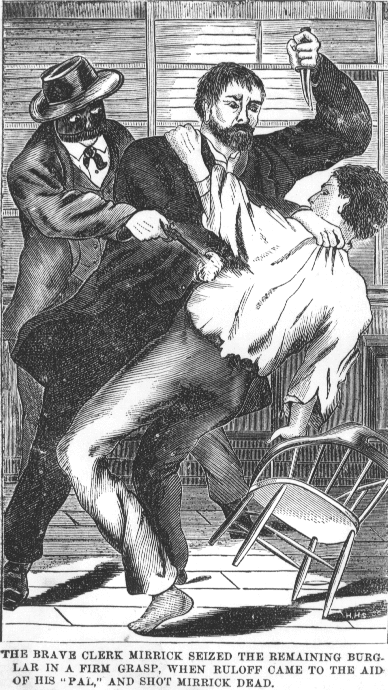 The early morning of August 17, 1870 Gilbert Burrows, a clerk at Halbert’s dry goods store in Binghamton, New York, rushed from the store into the street to sound the alarm – Fred Merrick, another clerk, had been shot dead during a burglary. The store had been robbed before and Burrows and Merrick were serving as night watchmen to prevent it from happening again. About 2:30 a.m. the clerks were awakened by three men who had broken into the store. A fight ensued and one of the burglars started shooting. Merrick had a pistol and tried to shoot back, but the gun jammed. He was shot in the head at close range. Burrows ran out of the store and the burglars escaped. Later that morning, two corpses were found floating in the Chenango River not far from Halbert’s store. Three men had been seen fleeing the store and heading into the river. Apparently two of the burglars had drowned trying to get away. Police began to round up suspicious individuals and before noon had three suspects in custody. One was a mysterious man, respectably dressed, carrying a satchel and an umbrella. He refused to stop when approached by the police and escaped them by running across a railroad track just before a train passed, blocking the road. They eventually found him crouching in the outhouse of a nearby farm. 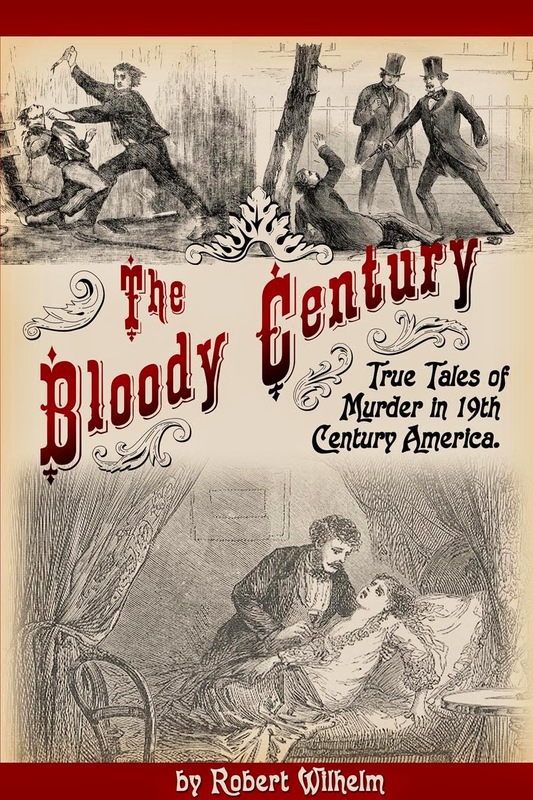 You are Edward H. Rulloff; you murdered your wife and child in Lansing in 1845. This man understands his rights better than you do, and will defend them to the last. An 1871 biography of Edward Rulloff was entitled The Man of Two Lives. This was an understatement. Rulloff—also known as James Nelson, E. C. Howard, James Dalton, Edward Lieurio, etc.— had been a doctor, a lawyer, a schoolmaster, a photographer, a carpet designer, an inventor, and a phrenologist. Most notably, Rulloff was a philologist, who could speak Latin, Greek and six modern languages and was working on a manuscript, Method in the Formation of Language, which he believed would revolutionize the field. The dichotomy of Edward Rulloff’s life was the fact that he financed his research by theft and did much of his philological work in prison. Rulloff started both sides of his life early, working in a law firm and spending two years in the penitentiary for theft, both before age twenty. 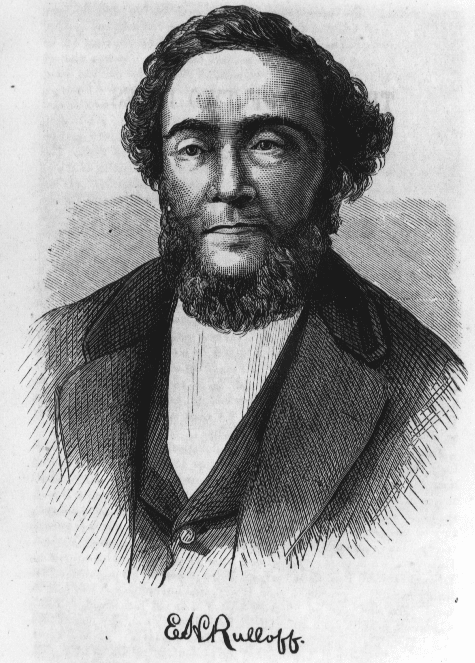 In 1842 he moved to the town of Lansing in New York’s Finger Lakes region, where he taught school and began studying botanical medicine with Dr. Henry W. Bull. A year later he married Harriet Schutt, but the marriage was in trouble from the start. Rulloff was extremely jealous and accused her of having an affair with Dr. Bull. The birth of their daughter, Priscilla, kept them together for a time, but Rulloff wanted to move west and Harriet did not. Then on June 23, 1844 Harriet and Priscilla disappeared. Rulloff said she had left him but the people of Lansing were suspicious. By the time an investigation was launched, Rulloff had left town. Police searched his house and found Harriet’s clothing and no evidence that she had moved out. When Rulloff returned to Lansing he said that he had moved the family to Ohio. This story was not believed and when Rulloff slipped away again, he was pursued, captured and charged with murder. The problem with the charge of murder was the lack of corpses. The police believed that Rulloff had sunk the bodies in Lake Cayuga, but repeated dredging had turned up nothing. In 1846 he was brought to trial anyway. Rulloff directed his own defense, and tried to focus on the lack of evidence, but the jury was predisposed to convict him of something. He was found guilty of abduction, and sentenced to ten years in Auburn Prison. 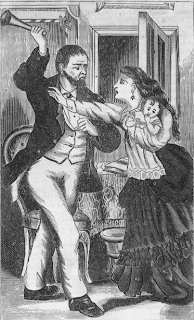 On the day of his release in 1856, a warrant was issued against Rulloff for the murder of his wife. Rulloff argued that it was double jeopardy, and rather than argue this point, the district attorney charged him instead with the murder of his daughter. Rulloff was tried again and convicted again. This time he appealed, but the verdict was upheld. While awaiting sentencing in the Ithaca jail, Rulloff began tutoring Albert Jarvis, the son of the undersheriff, in Latin and Greek. He also became close with his mother, Jane Jarvis, who did not believe that Rulloff was a murderer. In 1857 Rulloff escaped from jail. It was fairly obvious that he had inside help, since in addition to a chain around his ankle, there were eight locks between the cell and the outside. Al Jarvis remained a friend and associated of Rulloff for the rest of his life, and Jane Jarvis would later secretly visit when Rulloff was living in Brooklyn. Rulloff was recaptured and sentenced to hang. He appealed again and this time succeeded and a new trial was ordered. Tired of waiting for justice, the people of Ithaca formed a lynch mob, ready to storm the jail but Rulloff was transferred to Auburn before any damage could be done. Prosecutors decided there was little hope of success in trying him again for murder without corpses and there was no interest in prosecuting him for escaping jail, so Rulloff was extradited to Erie, Pennsylvania, where he was wanted for jewel theft. Rulloff was not prosecuted there either. Though nearly everyone in Western New York believed Rulloff was guilty of abduction , theft, assault, fraud, jail-breaking, and murder, he was now a free man. Rulloff moved to New York City and was soon joined there by Al Jarvis. He spent his time working on his book and robbing stores with Al and other accomplices. They specialized in stealing “sewing silk,” an expensive item that was easy to conceal and hard to identify. 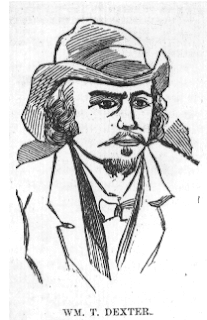 In 1861 Rulloff was arrested in Poughkeepsie and sentenced to two years in Sing Sing. In prison Rulloff met Billy Dexter and on his release, Billy joined the gang. Though Al and Billy preferred to work without Rulloff—he had an unfortunate knack for getting caught—he was with them in Binghamton that night in 1870, robbing Halbert’s dry goods store. Through the contents of their pockets, the drowned men were identified as Al Jarvis and Billy Dexter, and traced to the Brooklyn apartment where Rulloff had been living under the name Edward C. Howard. 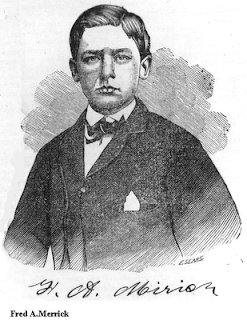 Rulloff was charged with the murder of Fred Merrick. Edward Rulloff’s murder trial received extensive press coverage and over 2,000 people a day came to watch in a courtroom built for half that many. The prosecution introduced witnesses from Brooklyn as well as the eye-witness Gilbert Burrows. Rulloff once again directed his own defense, claiming that he was not in Binghamton the night of the murder and that whoever committed the murder acted in self-defense and not premeditation. The jury deliberated for four and a half hours; the issue of debate was not guilt but the degree of the crime. Most wanted first-degree murder, but some were pressing for second-degree or manslaughter. 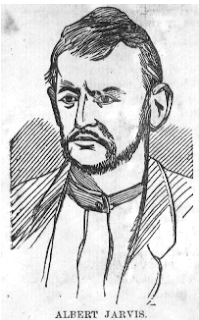 In the end Edward Rulloff was convicted of first-degree murder and he was sentenced to hang on March 3, 1871. In the prison in Binghamton there is a man awaiting death who is too curious an intellectual problem to be wasted on the gallows. If a life be offered up to the gallows to atone for the murder Rulloff did, will that suffice? If so…I will bring forward a man who, in the interest of learning and science, will take Rulloff’s crime upon himself and submit to be hanged in Rulloff’s place. Outside of court, the people of New York ascribed multiple murders to Rulloff. Rulloff claimed that Al Jarvis and Billy Dexter drowned because they thought the river was shallow enough to walk across and neither man could swim, but the public saw their deaths as murder by Rulloff to prevent identification. He was also still accused of the murder of his wife and daughter, and now accused of killing his sister-in-law and her child who died while under Rulloff’s medical care shortly before Harriet disappeared. Before his execution, Rulloff confessed to killing his wife by smashing her skull with a pestle he used to grind medicine. He did not confess to killing his daughter, Priscilla, or anyone else. It was reported that Priscilla did not die but was raised by Rulloff’s brother. Edward Rulloff was hanged on May 18, 1871. Before his death he requested that his body be put in a vault so it would not be desecrated, but his request was not honored. Before his lawyer could claim the body, it was placed on public display and the owner of a local art gallery made a plaster death mask. His lawyer gave the body to Dr. George Burr of the Geneva Medical College who promised to bury the body in a private cemetery if he could keep the head for study. After the body was buried it was dug up and stolen by medical students. 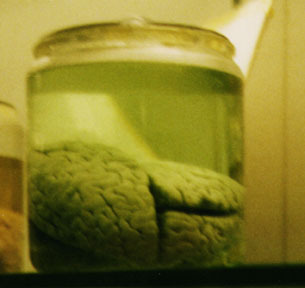 Edward Rulloff’s brain still exists as part of the Wilder Brain Collection at Cornell University. Bailey, Richard W. Rogue Scholar: The Sinister Life and Celebrated Death of Edward H. Rulloff . Ann Arbor: University of Michigan Press, 2003. Crapsey, Edward. The Man of Two Lives. New York: American News Co., 1871. Freeman., E.H. THE VEIL OF SECRECY REMOVED. THE ONLY TRUE AND AUTHENTIC HISTORY OF EDWARD H. RULLOFF. HIS BIOGRAPHY, TRIALS AND EXECUTION. THE MYSTERIES OF HIS LIFE REVEALED. HIS CONFESSIONS OF THE MURDER OF HIS WIFE, AND THE KILLING OF MYRRICK. New York: Binghampton Ny, 1871. There used to be a sandwich bar just outside the main Cornell campus entrance called Rulloff's which had a glasses display of his boots and a book. I wonder if it is still there? I have not been to Ithaca, NY in 20 years but it would be worth a visit the next time I'm in the area, if ever. Ah, yes, it's still there. Wonder if the memorabilia is? There is a death mask somewhere too. Sounds like there are pieces of Rulloff all over Ithaca. If you go back, let us know if the memorabilia is still there.